With the exception of a slight tick up in ISO-NE, the remaining markets all trailed downward over the report week. 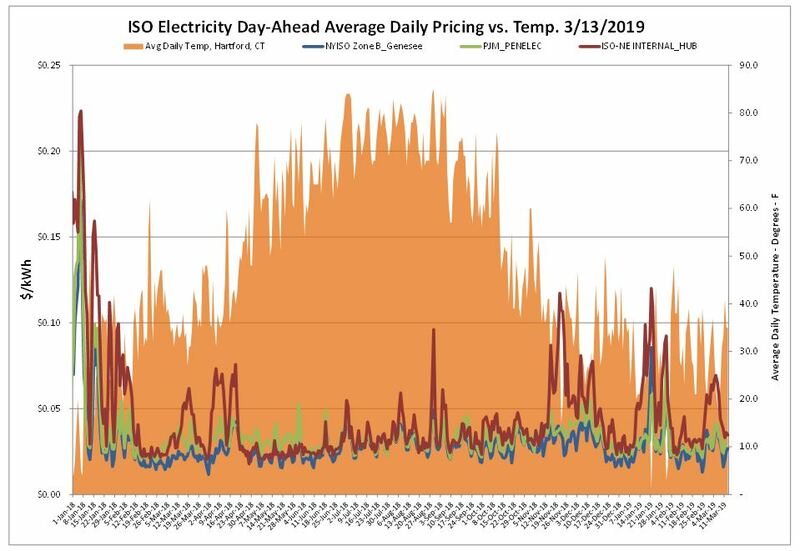 Will we continue to see a downward trend in electric prices coming out of the winter period? Only time will tell. With the onset of more seasonable weather, the day-ahead market saw some relief. 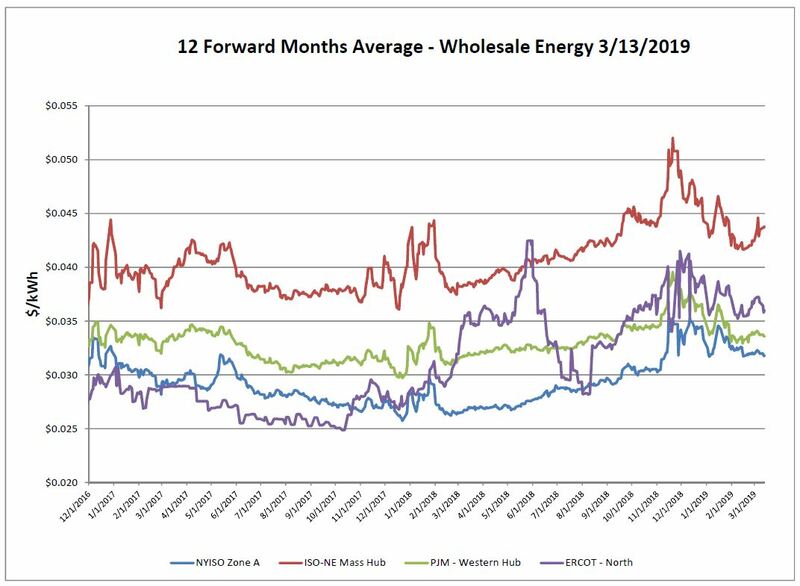 Demand for natural gas continues to rise, driven by changes in the U.S. and international markets, such as increasing exports of natural gas and liquefied natural gas. Regardless, prices still remain favorable. 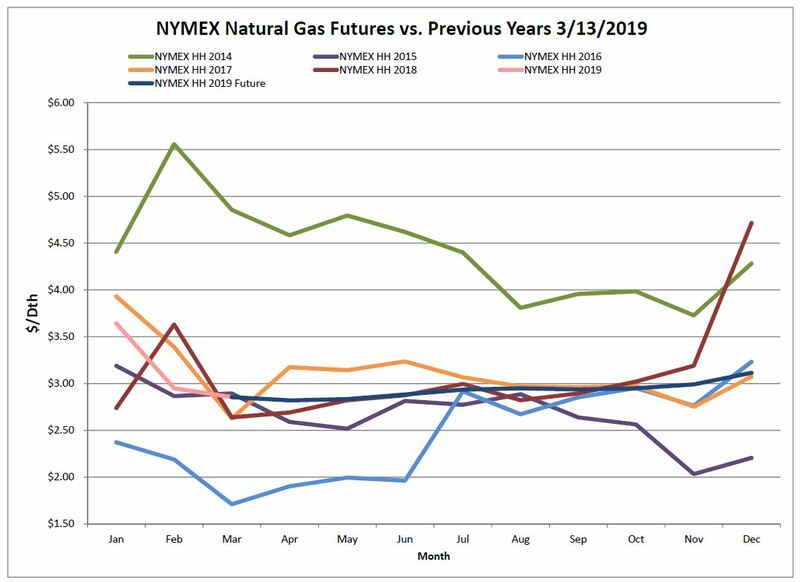 Over the report week there was a small drop in prices on both the NYMEX and Algonquian basis. A net decrease of 204 Bcf from the previous week was reported. 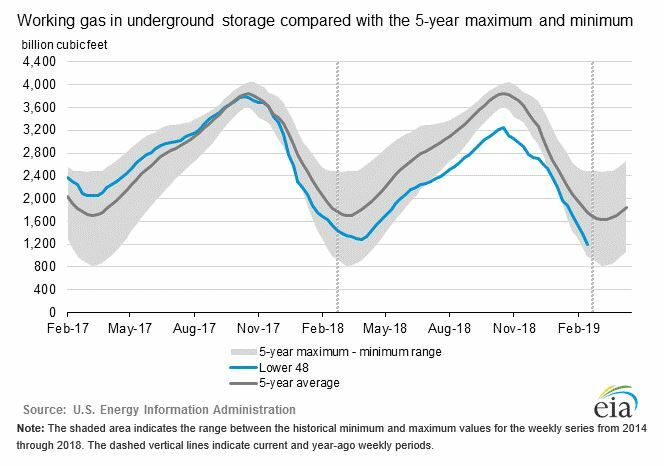 Working gas in storage was 1,186 Bcf as of Friday, March 8, 2019, according to EIA estimates. The fourth week in a row that the weekly storage pull was much larger than normal, and far larger than the 88 Bcf draw last year for the same week, as well as the 99 Bcf five-year average. This run up in storage withdrawal was due to the previous weeks weather being unseasonably cold. Weather forecasts are calling for more normal temperatures for the balance of March. If that shakes out, storage could see a break in the trend of withdrawals. End of withdrawal season is typically April 1st. End-of-season projections are in the neighborhood of 1,040 Bcf, a 23% deficit to last year, and 36% below the five-year average. 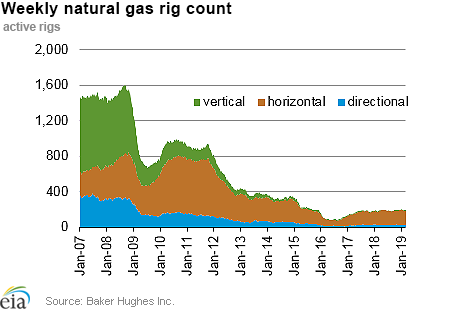 The Baker Hughes exploration gas rig count remained the same from last week for a total of 193 rigs. This is 4 more rigs than were in operation at this time one year ago when there were 189 rigs. 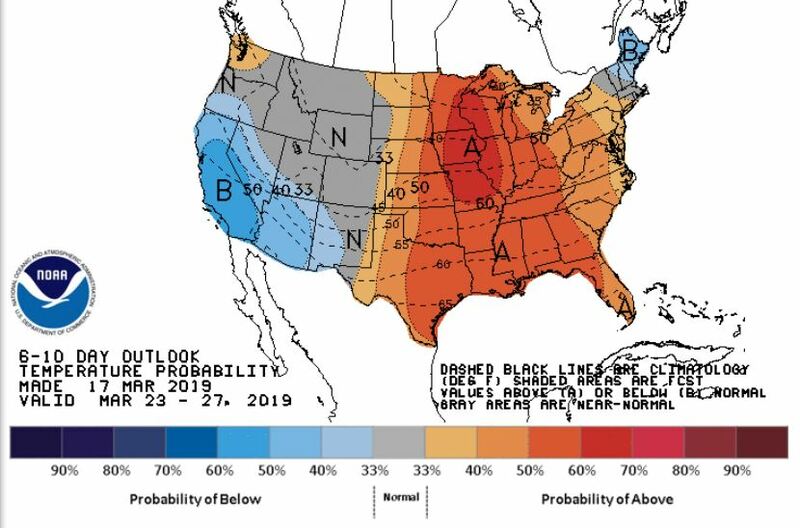 The NOAA 6-10 day outlook predicts more seasonable weather returning to the majority of states for the remainder of March. HARRISBURG, Pa. (AP) — Legislation designed to pump hundreds of millions of ratepayer dollars into Three Mile Island and Pennsylvania’s other nuclear power plants is being introduced Monday and could usher in heated debate over whether the plants deserve what critics call a bailout. For the third year in a row, the U.S. solar industry installed double-digit gigawatts of solar photovoltaic capacity, with 10.6 GW coming online in 2018.